The H.Upmann Epicures is an affordable, bold and complex Short Panetela, 4.3” (110mm) long, of 35 ring gauge, and comes in a 25 cigars box. 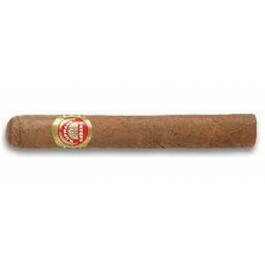 This is a rather short smoke (less than an hour), that has the very DNA of H.Upmann, clean and strong tobacco flavor. This is no longer the Epicures that was machine made until 2002, it is hand rolled in a beautiful cigar. The size is optimal for a powerful cigar that develops manly taste, tobacco wood, leather. But there is also some cream, sweet notes of vanilla, honey, and some grassy notes. Ideal for a short winter smoke, it is not very complex, but provides you with the perfect Cuban kick that you are looking for. It has also great potential for ageing, 2 years are recommended. The H.Upmann Epicures is a very good option for a strong cigar and when the time is of the essence. •	Delivers powerful and beautiful tobacco flavor, with notes of wood and leather. •	Affordable smoke, great everyday cigar. This cigar is for aficionados of "clean tobacco taste". The cigar is looking good, but won't win a beauty prize. Hand-rolled since 2002, its wrapper has a nice brown color. The wrapper smells of cedar, pepper, hay and dark chocolate. Upon cutting the cap, the draw is good, while slightly on the tight side. The pre light draw gives lots of pepper on the lips, and some strong aromas on the palate, wood and coffee. Once lit, the cigar burns well, without any issues. The first third of the cigar is rather powerful, strong and clean tobacco. The smoke is powerful in strength too; however, we can still perceive some creaminess and some notes of fruits, honey and wood. The flavors are reminiscent of a H Upmann Half Coronas at this stage. In the middle third, the strength mellows just a bit, but remains quite powerful overall. It is also creamier, sweeter, and spicier. There are also notes of hay and grass. In the final third, the flavor profile remains similar, but the strength increases again, and there is a lot of pepper too. In summary, it is a great cigar for aficionados of strong cigar with pure tobacco taste.